Last summer during my no spend challenge, I looked for the cheapest laundry detergent that still had positive reviews. That turned out to be Foca. 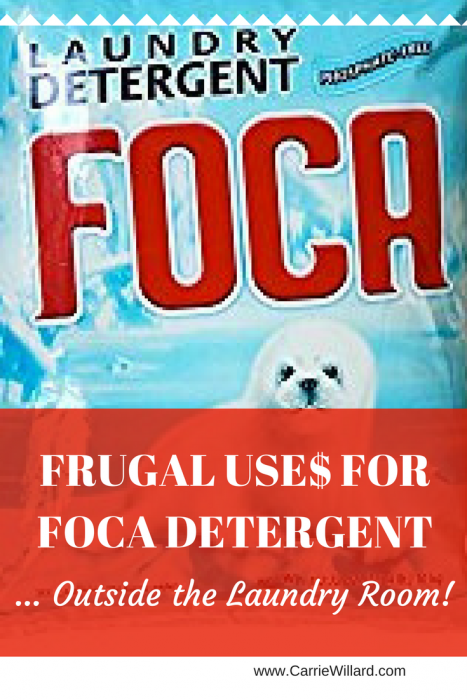 Foca laundry detergent comes in huge bags and is dirt cheap. Like, 4 pounds for $3.42 cheap. I liked the convenience of a large bag of detergent. It meant I didn’t have to think about buying laundry detergent again for a long time, even though I do laundry for my family of 9. I used Foca for several weeks with good result. Then we moved. We inherited a brand new eco-friendly, water-saving HE washing machine with the house. And the Foca didn’t work so well anymore. It wouldn’t dissolve properly even though I used far less than the recommended amount. And because I was using so little, my clothes weren’t getting as clean as they used to. Foca laundry detergent says right on the label that it’s not recommended for HE machines. Ruh-roh! In my ongoing efforts to be a frugal Frau, I refuse to throw perfectly good products away. There’s always a creative way to use something up. So I tried using Foca for cleaning around the house. I discovered that it’s an excellent all-purpose household cleaner. Here’s how I use it. Being mildly abrasive, Foca is awesome at cleaning tubs, sinks and tile. 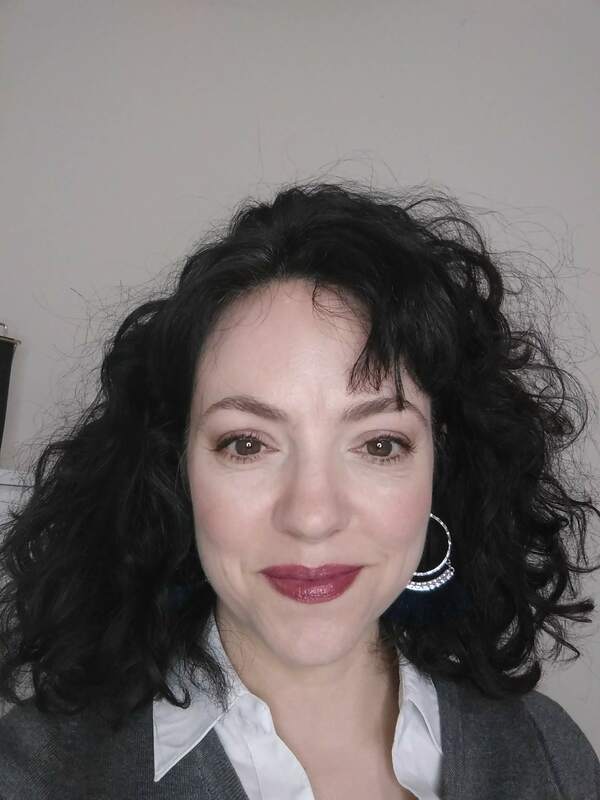 I used it to clean my bathrooms this week and they’re sparkling. Since Foca is blue, it’s easy to see where you’ve sprinkled it. It doesn’t take much either. I used just a couple of tablespoons of Foca to clean the tub and fixtures. I sprinkled a bit of Foca at the bottom of the containers that hold the toilet scrub brushes. All I have to do to give the toilets a quick clean is to grab the brush. 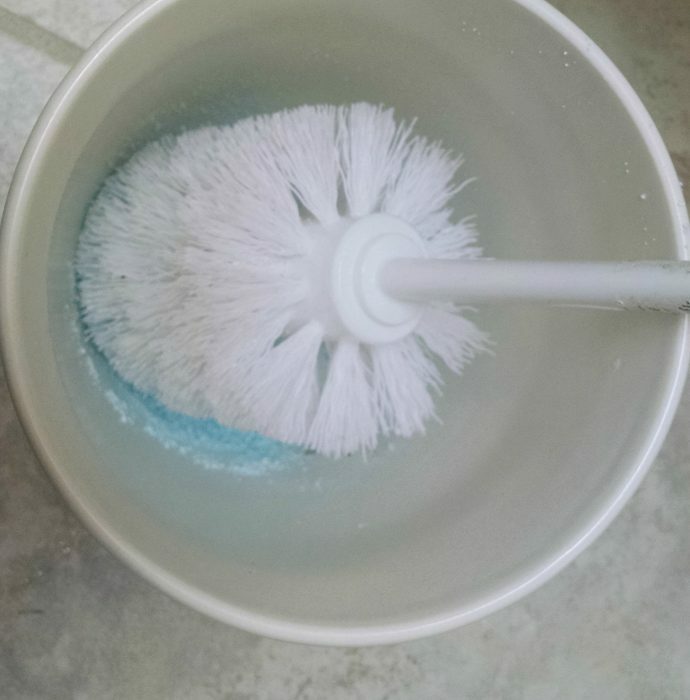 The detergent sticks to the brush, so I can skip that step of adding toilet cleaner to the bowl. I wouldn’t do this if I had a crawling baby who might become interested in the pretty blue powder! Foca smells a bit like baby powder but isn’t overwhelmingly perfume-y. So it’s great for deodorizing. Foca is handy for freshening trash cans. I first cleaned my trash cans with it, then dried them and sprinkled Foca at the bottom. They smell nice. And the detergent absorbs any moisture. If it gets damp, it clumps and makes it easier to clean the can. And when it’s time to clean the trash cans, I just add water and swish it around, dump it out and then rinse. Time-saving cleaning hacks are my friend. If you have kids, you know how an older car eventually starts smelling like sour milk and french fries? (I know I’m not the only one!) Putting a little cup of Foca in the car overnight would help with that. So would the next tip. A certain child who shall remain nameless Julien knocked a cup of coffee over, spraying my carpeted stairs in a million spots. I added a bit of Foca to my carpet cleaning machine, and it made short work of the stains. I’m planning on writing an entire post on my Bissell carpet cleaning extraction machine and how much I love it! Let’s just say it’s removed red wine from my pale beige carpet. Next time we vacuum our car, I plan on sprinkling a bit of Foca on the floors and letting it sit for a while before vacuuming it. I also put a bowl of Foca in our shoe cabinet, which unfortunately smells like… used shoes! Laundry detergent is an excellent degreaser. I haven’t used it for this purpose yet, but I’m sure I will at some point. I’m going to try cleaning my oven with it next. If we ever have an oily spill in the garage or driveway, I’ve read that Foca sprinkled on it and left overnight will make make stain removal easy. Foca is so cheap! And it requires a small amount to be effective for cleaning. For washing clothes, the label says to use one full cup for washing a load of laundry, but I never used that much. For laundry, I pre-treated stains by dampening the item and then sprinkling on a tiny bit of Foca. Then I would add about 1/3 cup to the load, depending on how large it was and how dirty the clothing. Some people complain about how Foca comes in a large plastic bag and not a more convenient container. I put mine in a large glass jar. You could also store it in a small bucket or washtub, or a small storage container with a lid. I’m going to put some Foca into my glass Parmesan cheese shaker to use for sprinkling in the sinks and tub for cleaning. Down with evil laundry detergent measuring cup! Have you ever found a creative use for a product you couldn’t use for its intended purpose? Really useful post! I have 2 containers of dish washing powder sitting here unused because I no longer have a dishwasher and dishes get washed in the sink. Now I know what I can do with it. Thanks! I think dishwashing powder contains a little bleach, so it would probably be excellent for toilets and anything that could use deodorizing (trash cans etc). Which soap did you change to for your HE washer? 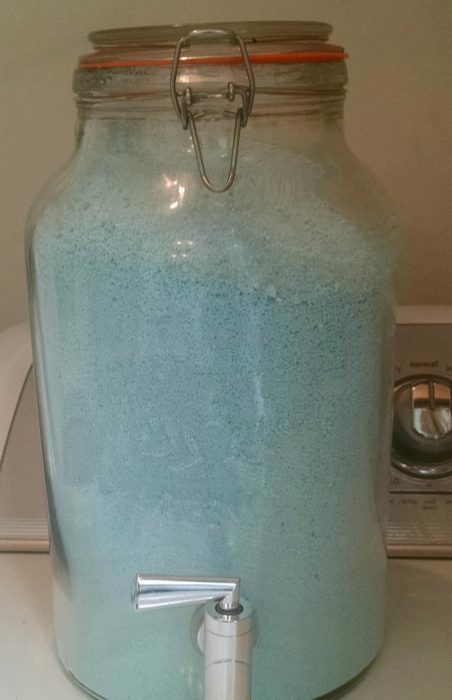 Hi Shanna, I now use Norwex laundry detergent that I buy from a friend who is a distributor. I love it. Best I’ve ever used.